Over the weekend of November 12-14, nearly two dozen international experts on the Triassic Period gathered at Berkeley for several days of research, discussion, and collaboration on the animals that populated the earth at the beginning of the Age of Dinosaurs, over 200 million years ago. 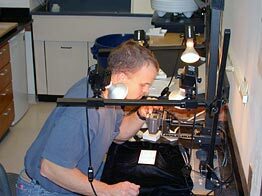 Some participants were established workers in the field, but most were students and younger professional scientists. They came to benefit from each others knowledge and from the UCMPs great collection of Triassic fossils, one of the best in the world. 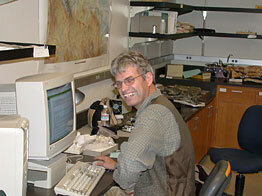 Nick Fraser (Virginia Museum of Natural History) was one of the “senior” scientists who came to participate and learn. relatives of mammals in the Permian. The diversification of these reptiles through the rest of the Triassic was dramatic. Many new groups flowered and faded quickly, but the entire “modern” land faunadinosaurs, pterosaurs, lizards, turtles, crocodiles, mammals, and other groupshad its beginnings in the Late Triassic and took over things relatively rapidly.